Ο τρίτος τόμος κόμικς Harley Quinn Rebirth, από την DC, περιλαμβάνει τα τεύχη 14 έως 21. The latest chapter in the smash-hit action-comedy saga from Amanda Conner, Jimmy Palmiotti, John Timms and more is here in HARLEY QUINN VOL. 3: RED MEAT! With her life finally clear of psychotic clowns, Harley Quinn is eager for things in Coney Island to get back to (ab)normal. If only! Comics’ most adorable antihero is about to face the fight of her life! First, she’s taking on the corrupt mayor of New York City, whose evil plan for the homeless population will take a bite out of the Big Apple in more ways than one. They say you can’t fight city hall, but they haven’t met Harley Quinn! Next, it’s the return of Harley’s former adversary, Harley Sinn! This twisted sister is out of prison with plans for revenge. When Sinn targets someone Harley loves—and thought she’d lost—can anything stop the wrath of the mighty Quinn? Find out in HARLEY QUINN VOL. 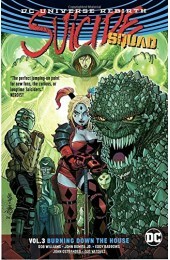 3: RED MEAT, which collects the lead stories from HARLEY QUINN #14-21.